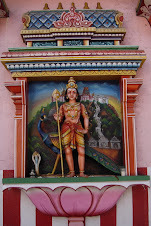 I've been working on updating a travel guide's coverage of Tamil Nadu, so part of our time in Mamallapuram was spent touring hotels, asking about AC, and demanding to look at dinner menus in the middle of the afternoon, long before dinner was available. One of the tourist sites we visited on the way out of town turned out to be so much cooler than I thought it would be. 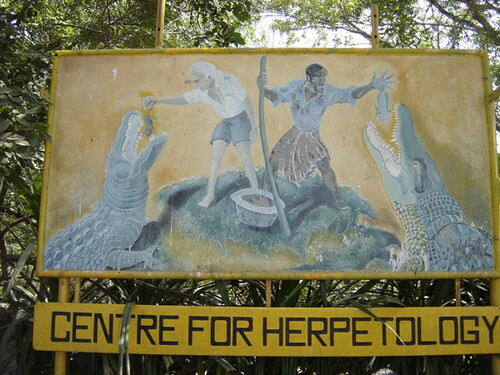 The Center for Herpetology is basically two scary spots in one. 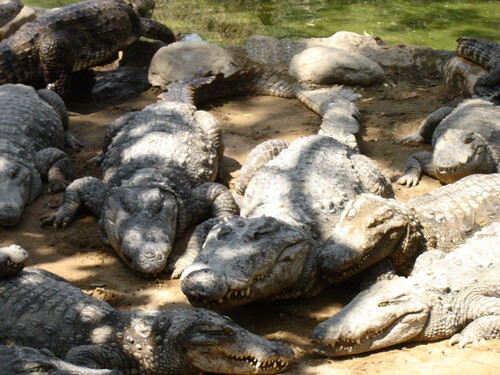 First, you have small ponds with lots and lots of crocodiles (and even a few alligators, in case you're from the Americas and feeling a little homesick). The crocodiles are in sunken areas with pools, and there's just a small gap and a couple walls between you and them. At an exhibit of muggers (Indian-native crocodiles), you can get a guy to come out with a kilogram or so of chopped up mutton. He'll throw it all them -- a highly entertaining sight. It's a good trick to get guests to pay for feeding the animals, but it was also fun. There's also an area in which snakes are milked for their venom, to be used in anti-venom. In addition to cobras, there were also kraits, a small, somewhat boring-looking snake whose venom is a lot deadlier than a cobra's. It was terrifying and awesome. 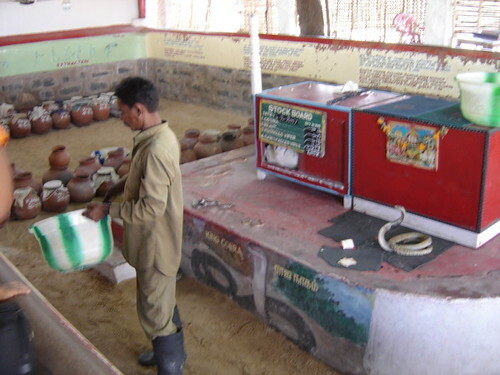 In the picture below, all those pots in the background contain snakes. And the plastic bucket contains MASSIVE quantities of snakes as well! 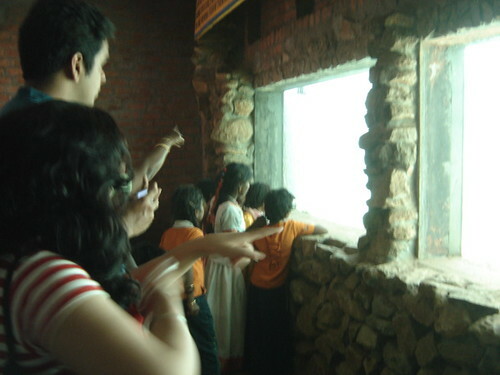 There were turtles too, in well maintained tanks (a rarity in India). They were loveable, but come on, they're going to have to take second seat to deadly serpents and alligators and crocodiles. 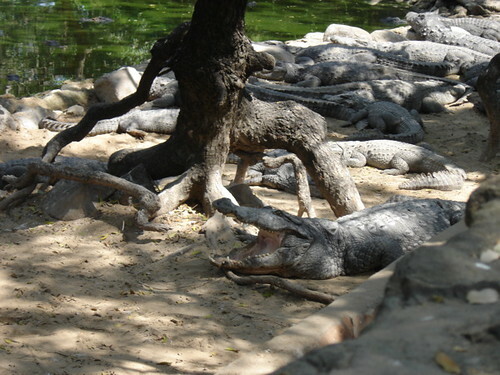 Here are a bunch of families looking at a crocodile swimming around in its strangely graceful way. It was almost more fun watching the kids get all excited about it, though. Some one I took to show the croc bank remarked that was an awful lot of handbags on the move... Oh, Well!